A little crab was learning to take his first step. He would first move to the left and then to the right. Never did he venture to the front. The mother crab sat in a corner watching her son take those baby steps. She wasn’t pleased at all. ‘Why doesn’t the child go ahead?’ she wondered. Instead of moving forward, he is going sideways. What kind of walking is this? How will he be a success in life? So she decided to advise the little crab. ‘What are you doing my dear,’ she asked, ‘Try to walk straight. 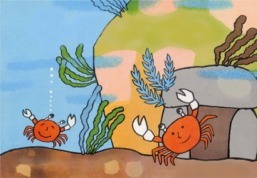 Why are you going sideways?’ The little crab was saddened to hear his mother’s words. He had been trying since morning and now it was almost noon. And he still didn’t get it correct. He tried again and again but moved only sideways. Frustrated, he begged his mother to help. Now it was the turn of the mother crab. She rose majestically and started moving. But she also moved sideways. The more she tried, the more she failed in her attempt. The little crab cried angrily. ‘You are also not walking straight. It is certain that you don’t know how to. Then why do you expect me to do it right? Until then, the mother crab hadn’t known that crabs couldn’t walk straight. She cried at her own ignorance. We all know how to find faults. But how many of us know how to rectify them?